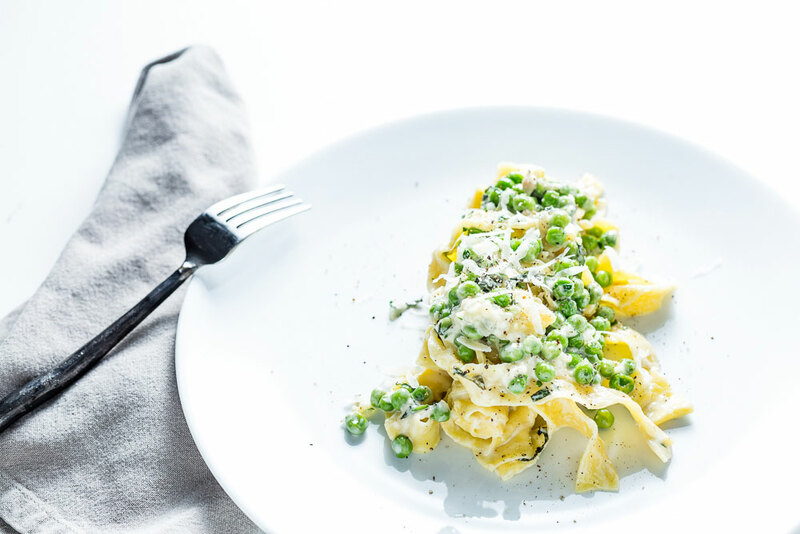 You can be enjoying this quick and easy springtime pasta with peas, lemon, mint and cream for two in just under 15 minutes. I love this type of pasta for a weeknight meal, because it is so satisfying. 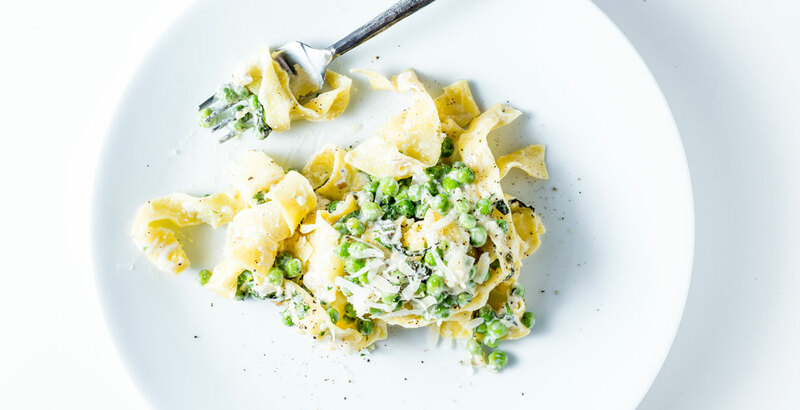 The peas, mint, lemon and cream go together kinda like peas and carrots. 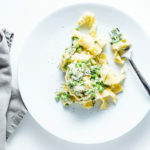 Just a wonderful combination of sweet and crunch from the peas, acidity from the lemon, salty from the parmesan cheese and the essence from the fresh mint..
You can really use any type of pasta noodles for this and it will be great. I happened to have some fresh tagliatelle, so that’s what I used, but any wide noodle or orecchiette would be great. 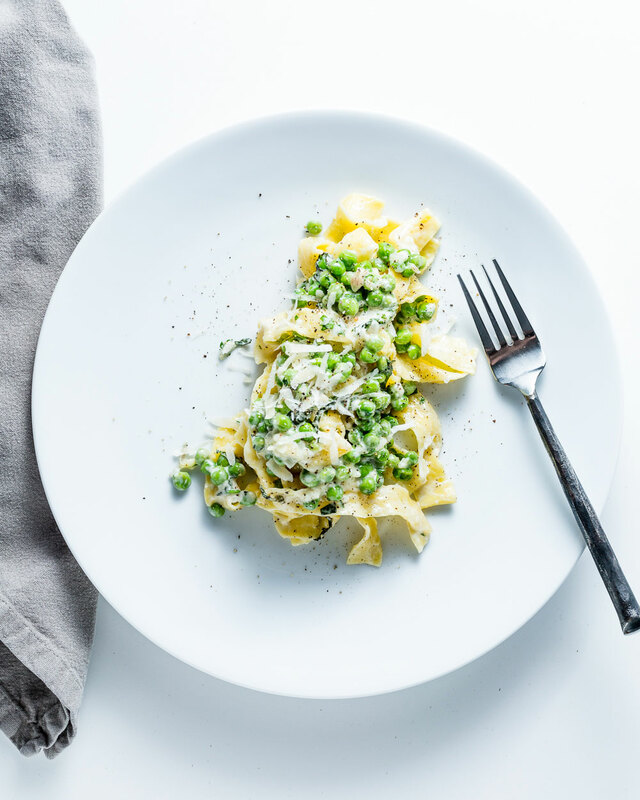 Fresh English Peas are the best and are in their peak season from Spring through summer, but you can often find them throughout the year. Substituting sweet frozen peas is just fine too. Cook the pasta al dente, reserving 1/4 pasta water to thin the sauce if becomes too thick. Meanwhile, heat butter over medium heat and sauté the chopped shallot with a pinch of salt until it is translucent. Add garlic and the peas, and cook for 2 more minutes. Remove form heat and mix in the grated parmesan, lemon juice, salt + freshly ground pepper and the chopped herbs. Add the herbs right before serving, as the mint will discolor quickly when in contact with heat.